Today the Tax Foundation released its 2014 index of International Tax Competitiveness. Of the 34 countries ranked on the basis of "more than forty variables across five categories: Corporate Taxes, Consumption Taxes, Property Taxes, Individual Taxes, and International Tax Rules," the U.S. came in #32, only a few points ahead of notoriously tax-loving France. The chart above shows my representative sampling of 20 of the countries included in the index. Estonia has the most competitive tax system in the OECD. Estonia has a relatively low corporate tax rate at 21 percent, no double taxation on dividend income, a nearly flat 21 percent income tax rate, and a property tax that taxes only land (not buildings and structures). 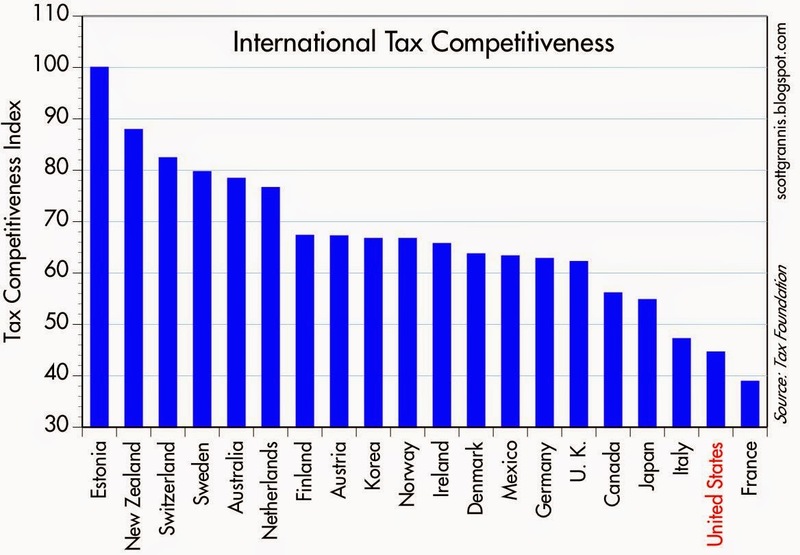 France has the least competitive tax system in the OECD. It has one of the highest corporate tax rates in the OECD at 34.4 percent, high property taxes that include an annual wealth tax, and high, progressive individual taxes that also apply to capital gains and dividend income. The ITCI finds that the United States has the 32nd most competitive tax system out of the 34 OECD member countries. The largest factors behind the United States’ score are that the U.S. has the highest corporate tax rate in the developed world and that it is one of the six remaining countries in the OECD with a worldwide system of taxation. The United States also scores poorly on property taxes due to its estate tax and poorly structured state and local property taxes. Other pitfalls for the United States are its individual taxes with a high top marginal tax rate and the double taxation of capital gains and dividend income. Taxes are a crucial component of a country’s international competitiveness. In today’s globalized economy, the structure of a country’s tax code is an important factor for businesses when they decide where to invest. No longer can a country tax business investment and activity at a high rate without adversely affecting its economic performance. In recent years, many countries have recognized this fact and have moved to reform their tax codes to be more competitive. However, others have failed to do so and are falling behind the global movement. This goes a long way to explaining why the U.S. economy has been struggling in recent years. Today's WSJ has an op-ed that sheds even more light on the issue. If there's any surprise here, it's that the U.S. economy is not doing worse. We are still relatively prosperous in spite of our onerous and burdensome tax code. This speaks volumes to the inherent dynamism of the U.S. economy, which is rather adept at overcoming adversity. If we only freed the economy from its tax shackles, it's hard to imagine how much better we could be doing. We need serious and far-ranging tax reform. Now. Worse than the US tax situation is the lack of any real political push to fix it. Europe and Japan are in an economic mess, yet they have a better tax situation. They have been able, to some degree, protect their businesses from high taxes (and a desire to relocate). The US is still taxing business like it has a competitive edge, but it is gone. If the US fixes this, it still will suffer the fate of Europe and Japan, as the government is growing its redtape, cronyism, disincentives and corruption faster than the productive economy. Well, cut federal agency spending and eliminate the corporate income tax. Wipe out taxes on dividends too. I think we will prosper without a HUD, Labor Department, USDA, NSA or Commerce. Cut DoD in half, privatize the VA.
we need it but it AIN'T gonna happen with O in charge. Benjamin, if you ever run for office you've got my vote locked up. Every time you've opined, I find myself in enthusiastic agreement with you. Even on seemingly out-of-step opinions - like the cutting of DoD spending in half - we're on the same page. Play on, playa. Thanks for writing. But I think we are the only two guys in the whole USA who think that every federal agency should be cut. Usually there is sacred-cow status on one side of the aisle or the other. Food stamps are sacred, or DoD is sacred, or Education is how we will be competitive, or the NSA is necessary. Indeed, I think every federal agency should be cut. But I laugh at myself when I think of the political feasibility of it. I also would like to see peace on earth. Ain't gonna happen. I'm reminded of the last line in PJ O'Rourke's Parliament of Whores: "And the whores are us." Ed: very interesting chart! It's a great illustration of the basic principle behind the Laffer Curve. When tax rates are too high (uncompetitive), revenues are lower than they otherwise could be. Lowering onerous tax rates and eliminating distortions can actually generate more revenue by making the economy stronger and the tax base bigger. The U.S. could benefit tremendously from a tax code like Estonia's.